With a healthy digestive system, it is virtually impossible to be gain weight with whole, raw, live foods! Now that’s easy weight loss! You can eat anything you want, as much as you want (as long as it is raw, whole, live food) and not gain an ounce in most cases. Exceptions include people with digestive or glandular disorders – though they will probably do better on raw, live foods. 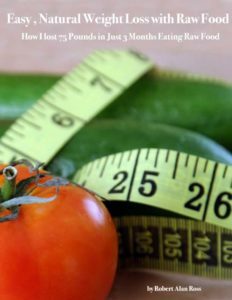 When you first start eating more raw foods, you may need some time to cleanse, detoxify and rebuild your digestive system before noticing substantial weight loss. That may take anywhere from a few months to a few years. You will start feeling much better fairly soon, after a period of detoxification and getting over the actual “addictions” we all have to toxic foods. An imbalance in one part of the body effects your entire system. Weight is a symptom of what is going on with your elimination system, glandular system, emotions, sleep patterns, stress levels, liver, colon, skin, lungs, blood, spirit and chi or energy levels. The enzymes found naturally in whole, live, raw foods help with obesity at the “whole being” level. You see, enzymes do much more in your body than help digest food. Enzymes are responsible for every single chemical reaction in every single cell of your body. All your minerals, herbs, vitamins and hormones cannot do their jobs without enzymes. Your can’t lift an arm or think one thought without the help of enzymes. In fact, you could say that enzymes are, biologically speaking, the source of life. A diet without a source of live enzymes is removed from the source of life. Things removed from their source of life slowly begin to die. For us, that leads to dis-ease, excessive weight gain, depression – many of the maladies that plague us today. Inadequate amounts of any of these digestive enzymes results in incomplete digestion causing left-over waste product that toxify the body. When we consume foods rich in enzymes, the foods “self-digest,” causing little or no stress on the body. For example, lipase, a fat splitting enzyme, is found abundantly in raw, live foods. However, few of us eat enough raw foods to get enough lipase to burn even a normal amount of fat, not to mention any excess. Lipase helps your body in digestion, fat distribution and fat burning for energy. Lipase breaks down and dissolves fat throughout the body. Without lipase, fat stagnates and accumulates. You can see it on your hips, thighs, buttocks and the stomach. Protease is another enzyme for easy weight loss and maintaining a healthy body. Protease helps break down proteins and eliminate toxins. Eliminating toxins is essential when you are burning fat. Your body stores excess toxins in body fat. As your body begins to burn this fat the toxins are released into your system. This can sometimes cause water retention and bloating. Since Protease attacks and eliminates toxins, it is crucial to have plenty of protease during fat loss. Also, common sense tells us that if you cannot get enough nutrition from the food you take in, which is what happens when you cook food, your body receives a signal that it needs to store fat to prevent starvation and will hold on to even more fat. It will also send a signal that you are hungry. This results in a vicious cycle of eating more and more and still feeling hungry. Combine the physical effects with the mental effects of poor digestion and insufficient enzymes with your natural reaction to all of this emotionally and It can lead to eating disorders, depression and anxiety as well. if you eat close to 100% fresh raw, whole foods, then you get adequate nutrition and enough enzymes to digest your foods properly. if you eat cooked foods, you’ll be eating dead foods that have NO enzymes and are loaded witih toxins created by cookiing. That means your body must scavenge enzymes for digestion from other metabolic processes in your body, wasting energy and resources. However, living food enzymes will over time restore energy and stamina and rebuild your healthy metabolism of all nutrients, including fats. When you feel better physically, you’ll feel better emotionally, too. Today’s modern high-speed lifestyle kills enzymes in more ways than just cooking food. Stress can damage enzymes. Food additives can kill them. GMO’s often have altered genes. Pesticides and herbicides stay on your food and can’t be washed off. Frequent air travel, work outs, coffee breaks, air pollution, food irradiation, radiation from Chernobyl and Fukushima — and even poor sleep – all kill enzymes. No wonder we are enzyme deficient! So eating raw, live, enzyme-rich foods is more than just a weight loss or digestion issue – it affects your whole life, your whole being. In fact, you’ll even be happier – and have more fun! Cooking also chemically changes healthy food into poisons that create dis-ease. You see, many toxins and carcinogens are created when food is heated or cooked. 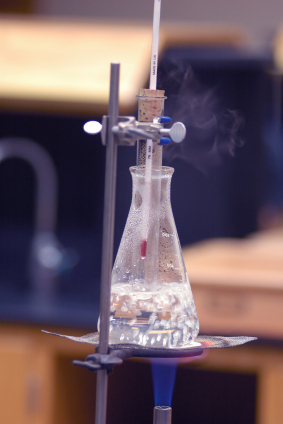 It’s a bit like a chemistry experiment in high school — combine several things in a beaker over a Bunsen burner and you’ll get a chemical reaction! This more often than not transforms molecules of nutrition into hazardous substances that can over time contribute to dis-eases from cancer and Alzheimer’s to diabetes and more! 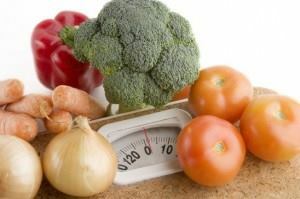 The Most Natural Weight Loss Plan — Raw, Whole, Organic Food! In our modern world, raw food is in a serious competition, not just with cooked foods but also convenience foods. Many diet programs have been abandoned by millions of people because they weren’t convenient enough! But a raw food lifestyle IS NOT a diet plan … its a way of life! Over time, as your begin to adjust to your new lifestyle, your body slowly returns to its normal, healthy metabolism, easily maintaining it’s natural weight. Change your eating habits and lifestyle so that you reduce stress on your digestive system with raw food. Replenish your body with enzymes by either taking a supplement or — my favorite — eating more raw, organic fruits and vegetables loaded with enzymes. Also, you can help restore your body quickly by drinking fresh fruit and vegetable juices. And always remember that you have a choice about what you put in your mouth! After struggling with chronic fatigue for years, which slowed my metabolism, I gained more weight than ever before. I got most of my health back on a diet that averaged about 80% raw foods, with lots of cleansing and detoxifying. But after four years eating mostly raw, I still had a long way to go. In fact, I was dropping weight so fast I had to eat lots of nuts, olives and avocados to slow it down. Over the next few months I lost 75 lbs. I kept that weight off for almost two years. Since then, it has been an ongoing struggle – yes, even for me. Though I have kept most of it off on a mostly raw diet (80-100% raw), I have a tendency to occasionally fall off the wagon – like most normal people! So last year, after gaining back about 50 lbs., I went did a 3-week cleanse and a strict raw diet, and lost about 35 lbs. in about two months. Of course results vary from person to person, and may change with what’s going on in your life – like they did for me. This isn’t magic – it’s enzymes — along with the elimination of all the toxins created by cooking! My metabolism slows down when I consume unhealthy toxins. But when I make optimal food choices, going back to what I instinctively know is right, it kicks back in. I think it’s perfectly normal to slip occasionally, so long as I get back on track eventually. Raw food works for me, and I decided to make it my life’s mission to help it work for you, too!